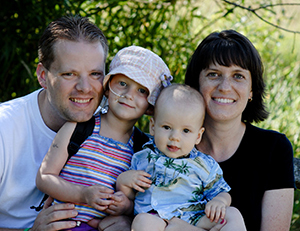 Over the next three years, Jenna endured chemotherapy, radiation and two major surgeries at Seattle Children’s. Meanwhile, Braden learned to crawl and walk in Seattle Children’s Cancer Care Unit. “Thankfully, Braden was a very easy-going baby and added so much joy to our lives during a difficult time. He brought so much love and happiness to Jenna’s final days,” she said. Tragically, Jenna died on Jan. 22, 2009. Braden was 2 1/2 years old. “I remember, a week after Jenna died, Braden was sitting on the couch listening to some of her favorite songs and he suddenly asked, ‘Where did Jenna go?’ We had told him she had died many times, but he was too young to understand death is final,” Michele said. Braden’s questions about his sister would not wane over time, but Michele learned how to cope with her loss, and found support for her son, through Seattle Children’s Journey Program. Chris, Jenna, Braden and Michele Westerholm. The Journey Program was created in 1987 with a donation from the Liska family. Their child, Ann Liska, was a cardiology patient at Children’s for many years. After her death, and the subsequent death of her grandfather, the family approached Seattle Children’s to establish a program for grieving families, like themselves. Today, the Journey Program offers support to any family who has experienced the death of a child through support groups, counseling and resources. Chris and Michele started going to a Journey Program support group for parents eight months after Jenna died. 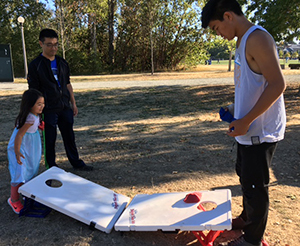 The Journey Program hosted a family picnic, during the summer of 2017, for families grieving the loss of a child. 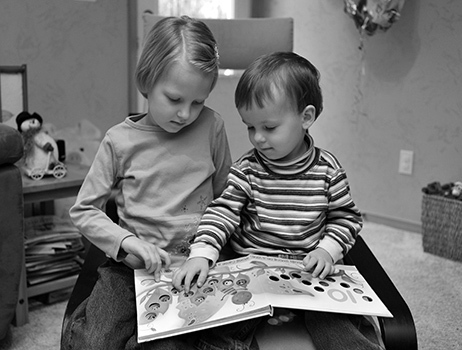 While the Journey Program is most commonly recognized for its parent services, it also supports the siblings of deceased children. “Children who have witnessed death, especially the death of a sibling, are forever changed,” says Kelsey Mitchell, a pediatric grief coordinator for the Journey Program. Kids are impacted differently at each age group, Mitchell noted. A preschooler might have a hard time understanding death, but they know their routine has changed, and that can be really challenging for them. They don’t necessarily have the language skills to explain what’s going on, but they feel grief. Young, school-aged children can experience increased separation anxiety. They can feel their grief physically, with symptoms like increased stomachaches or headaches. “Parents might not always recognize how their child grieves, but our grief support experts can help,” Mitchell said. The Journey Program hosts events for siblings experiencing grief, including movie nights, picnics and holiday parties. Occasionally, program organizers host art workshops, in which children will create “memory boxes” with their sibling’s photo or items they loved. Braden was 5 years old when he went to his first sibling grief workshop. Before he attended, Michele helped him write a letter to Jenna. At the workshop, Braden tied his letter to a red balloon and let it go “up to his sister.” Chris and Michele watched as Braden squealed with delight when his balloon floated into the sky. Braden is now 11 years old, and Michele said he still looks forward to attending Journey Program events. “Death is hard for the outside world to talk about, so to have a safe place like this is so important,” she said. 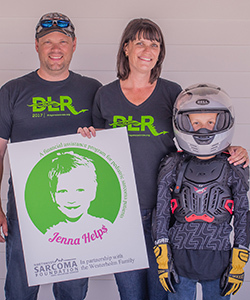 The Westerholm family has honored Jenna’s memory by creating the Jenna Westerholm Pediatric Help Program through the Northwest Sarcoma Foundation, raising funds for sarcoma families currently in treatment. Braden continues to mourn his sister, and the fact that he can no longer remember her. At school, when the topics of siblings come up, he sometimes bursts into tears. The Westerholm family honors Jenna’s memory every day by telling stories, looking at photos, or just missing her and the love she brought to our family, Michele said. “The Journey Program has offered us hope when we needed it the most, reiterating the fact that grief should be shared and that together we can survive,” she said. The Journey Program’s annual memorial service will be held Sunday, June 3, 2018. Any family who has experienced the death of a child is welcome to attend. Families interested in learning more about this event may email JourneyProgram@seattlechildrens.org.